In my role as Manager of the fishing lakes here at Cofton Holidays, my one regret is not being able to spend as much time on the banks as i’d like. That’s why i was delighted when my brother, Gavin, confirmed he’d be able to travel down from Bristol for to stay a night here at Cofton, allowing us to have a fish together! It had been a while since we’d done so, and naturally i was really looking forward to it. After talking on the phone the day before, we decided on fishing Trusham, which is our main specimen water. So he asks the question, “What’s working?”. After managing to spend a few hours with some of our guests during the past few weeks on both Luscombe and Trusham i was confidently able to answer “Bright pop-ups!”. Talking to the anglers on the bank is an essential part of my day-to-day routine, and the from this i know that a large number of fish have been falling to the pop-ups recently. It’s great to have a starting point when you’re fishing a water for the first time. I finish the phone call and enthusiastically set about rig tying – i’m ready to catch some carp! My pop-up rig of choice is the multi rig (see below), which is very effective at giving great hook holds with the bonus of being very easy to tie and the ability to change your hook without breaking your rig down. 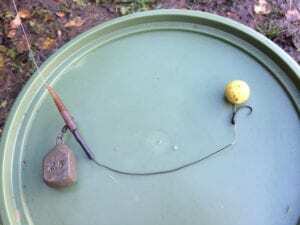 I fish this rig on a heli/chod set up, giving me a tangle free cast anywhere set-up. 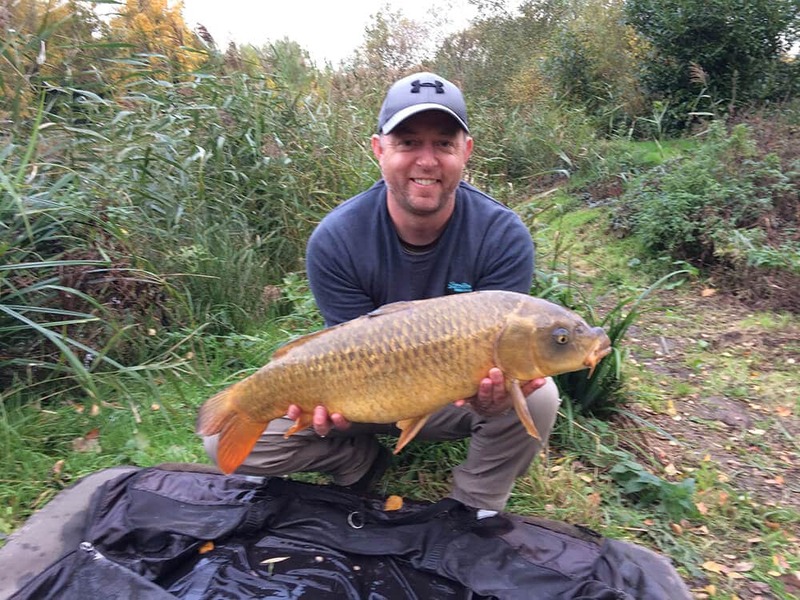 It’s great for casting at showing fish, something we put into practice during our session, more of that later! 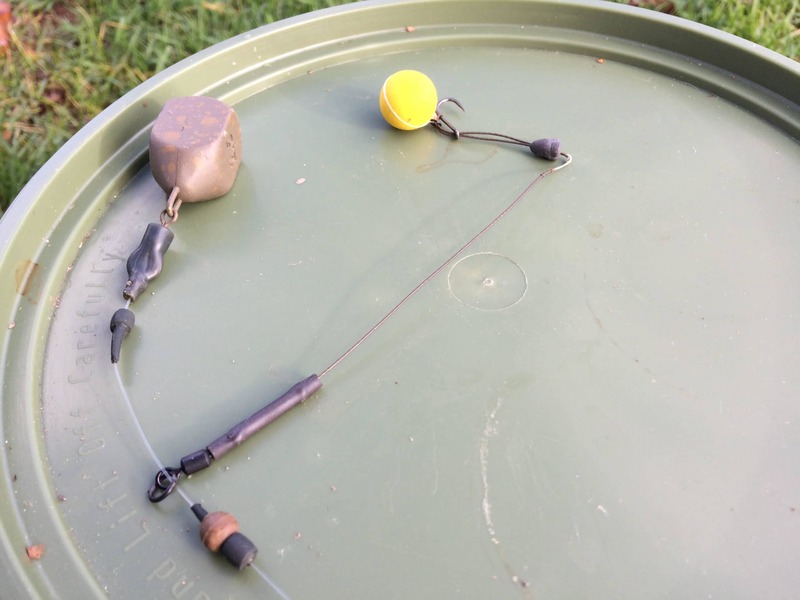 My pop up rig of choice – the multi rig and a heli/chod set up. I met Gavin down at the entrance, and as ever i was running a little behind so he’d already had a good walk around the lakes. “They’re crashing everywhere!” he exclaimed. The weather was warm and the air temperature was 14 degrees, despite intermittent heavy showers throughout the session the fish were loving it and didn’t stop showing the whole day! We set up on Swim 9, giving us access to nearly the whole lake with the added bonus of being able to fit all four rods in, as wanted a social fish. With fish showing on both sides of the lake it was easy for me to tell him to pick a side, as i was confident of catching wherever i was fishing. He chose left, leaving me with right. The shelter went up and the rods went out. 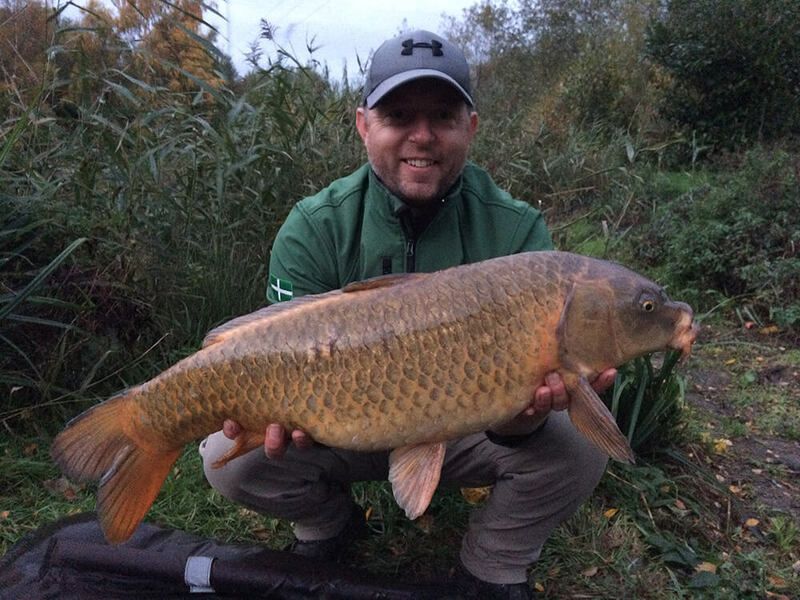 With fish crashing in the far bay by Swim 3, Gavin sent a Sticky Baits White Manilla pop-up over on the multi rig and then positioned his other rod just off the island with a 12mm Manilla Bottom Bait over a scattering of freebies. With so much activity i wanted to fish over some bait. As i mentioned earlier, my work here makes it unusual to have a whole day to fish, with much of my fishing coming in short sessions here and there. Having the whole day at my disposal, it felt right to a put a bit of bait out. 1/2 kilo of Mainline High Leakage Pineapple went out to a spot ten yards right of the willow. 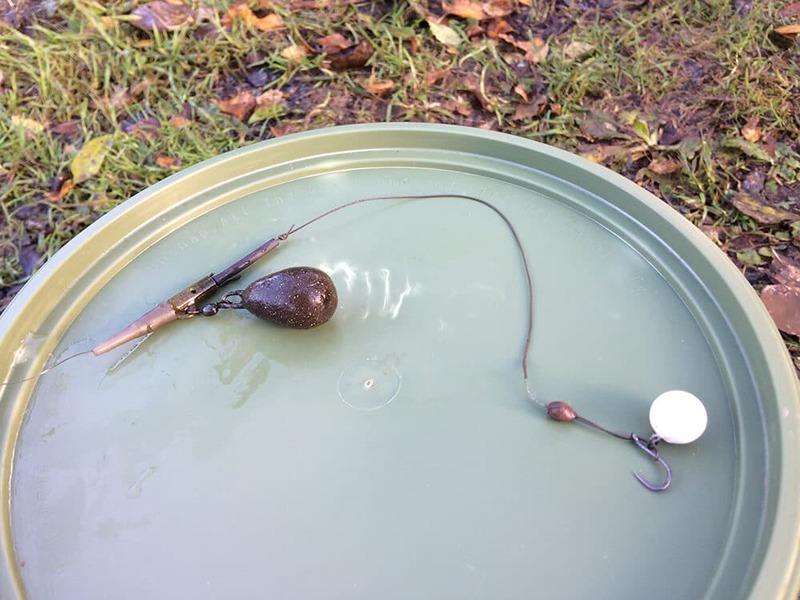 I fished a matching bottom bait on a lead clip set up over the top and on my other rod and i started with a matching pop-up cast away from the baited area towards the bay with no swims. Once we were all set, the kettle went on. One of the joys of carp fishing is a hot tea on the bank, especially in winter – i love a cup of tea! The action was instant, and we didn’t even get to finish our cuppas, as Gavin’s pop up rod rattle went off. The first fish on a set of new Nash Scope rods for Gavin, 9 footers to go in the camper van. It was an angry 10lb common that gave them their first test. The next 2 hours followed suit, with Gavin picking up another 2 carp at 8lb and 9lb respectively by casting his pop-up at showing fish down the left hand side of the lake. There was nothing for me at this stage, and i’m starting to think that maybe i got it wrong with the bed of bait. Over the next cup of tea, Gavin didn’t hesitate in reminding me that it was 3-0 in his favour, but this spurred me to change! I left the rod over the baited area knowing (hoping) that it would come come good and reel in the pop up rig. A fish crashed far down in the bay with no swims and i covered it with a solid PVA bag of pellets with matching double hook bait. 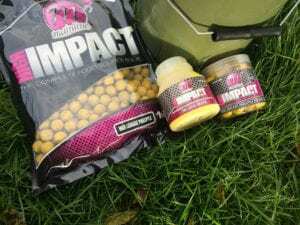 These are the feed pellets we use on the fishery and, as it turned out a little bit of inside knowledge made a difference as this was the next rod to go. After a good scrap, an orange koi cross surfaced and dropped into the waiting net. At 12lb 14oz (see below) this was the biggest so far, and i’m on the board. 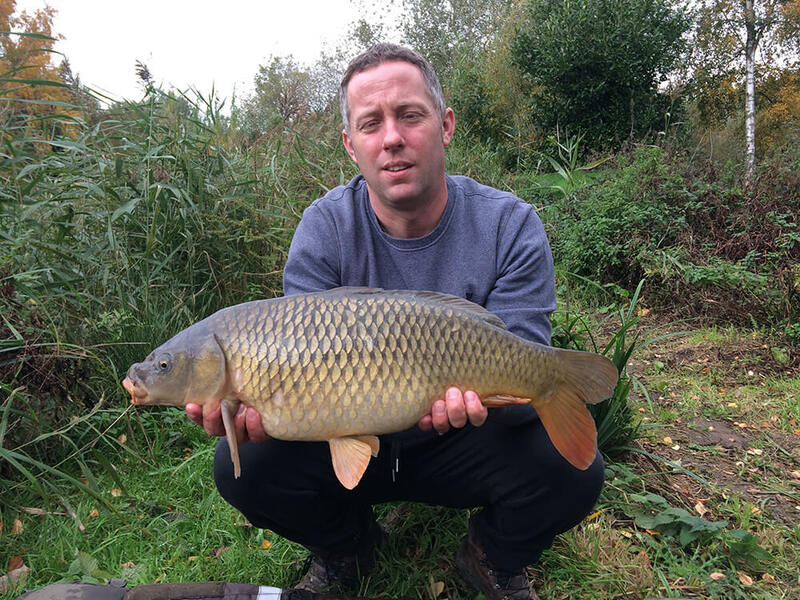 Gavin picks up another small common to the pop up, it’s certainly doing the job and every fish is nailed in the bottom lip. My rod over the bait starts to go into meltdown and a pretty mirror of 9lb graces the net. This was the start of a run of 5 fish over the baited area, taken in in just a few hours. I put around 20 baits out after every fish. Whilst i was catching Gavin’s rods had gone quiet and when my run of fish came to an end, 1 hour had passed with no fish for either of us. We were well into the afternoon now and it was raining heavily. Gavin had been out in the rain re-positioning his rods, i however was more than happy to stay sheltered with the kettle on. However he was rewarded when he had a take on his bottom bait rod, it was a better fish and gave a good account of itself. I braved the rain for net duties, and just as i made it to the platform Gavin’s other rod screamed off… Double take! With his other rod in hand, i netted his first fish before handing the rod over. Two fish on the mat. 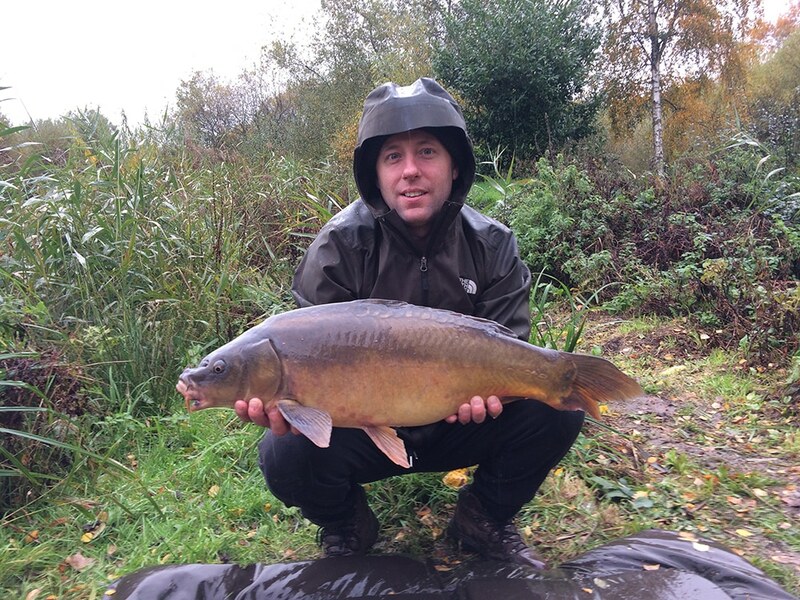 The first was a lovely leathery mirror of 13lb 5oz, and the other an 8lb mirror. Back amongst the fish and we are both out on the rods. As the light is starting to go we are both hoping for one last catch, the fish oblige and the pop up does it again for Gavin. This time with a low double mirror, which is one of the new stock from last October – a lovely looking fish with apple slice scales! We saved the best for last. I had cast a solid bag back down in the bay fishing the double pellet hookbait and it sat there for over an hour before giving a steady take. As i lifted in to the fish i knew immediately this was a better fish. It gave me 10 minutes of joy as it set about trying to evade the net, but luckily with Gavin on hand to do the honours, a great big orange koi cross eventually made the net. 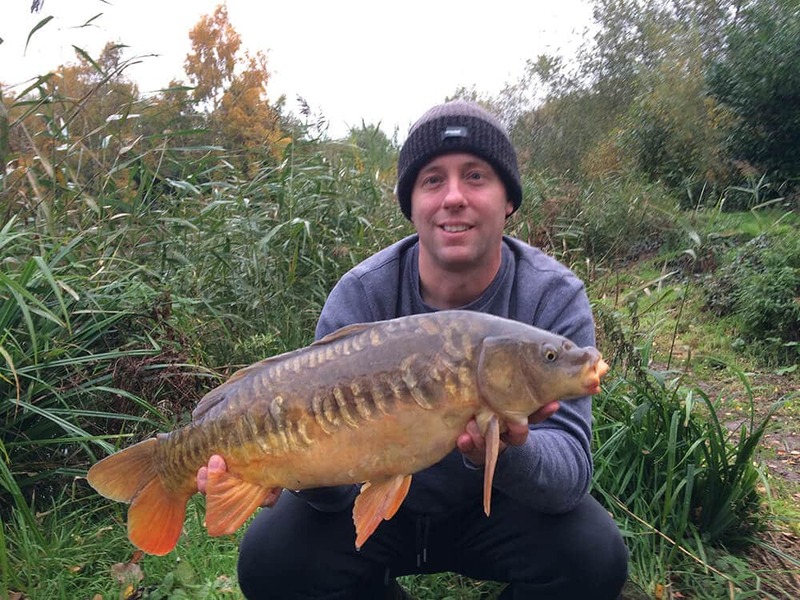 This fish is affectionately known as Tango, and this i’ve seen it on the bank a couple of times, this however was the first time i have caught this fish. Already a happy man, this beautiful fish weighed in at 16lb 15oz. A fantastic way to end a great day fishing with even better company. We’re open all year round, so if you fancy bringing your touring campervan, or treating yourself to a stay in our static caravans or holiday cottages then take a look at our late availability and offers.